Whenever danger strikes, Autobot Springer is there to strike back. He leaps into action at a moment’s notice, never caring for his own safety as long as there are others to protect. His heroic nature is backed up by incredible natural fighting skills and the inborn ability to lead. A brief history: Springer made his debut in the 1986 Transformers: The Movie and lived on in Transformers fandom throughout Season 3 of the original series, the Japanese Headmasters cartoon series, and also the UK Marvel, Dreamwave, and IDW G1 comic iterations. Several times he has been leader of the Wreckers, and at least a couple times has he been named as Rodimus Prime’s successor. The latter never came to pass, but hey, at least he’s been a Wrecker, and he always seems to be stuck in a love triangle with Arcee and Hot Rod. That basically wraps up what I know firsthand of the little green used-to-be-a-triple-changer, if you want more backstory, I suggest you go here. This ‘Classics’ version of Springer is decidedly not a triple changer, as has been the norm for the past umpteen (and by umpteen I mean 2) Springer toys. Recently, there have been two other G1-esque Springer toys; a 2007 Botcon exclusive redeco of Cybertron Defense Hot Shot and a Target exclusive redeco of Cybertron Evac in the recent Universe/Classics 2.0 line. This version is an Asia-exclusive toy that made it’s way to the US as a Toys R Us exclusive, and happens to be another redeco, this time of HFTD Tomahawk. At least this time around he got a new head! Apparently Hasbro likes Springer, but not quite enough to grant him his own mold. Springer’s alternate mode is a slightly futuristic attack helicopter that borrows some design features from the Eurocopter Tiger. Never having owned the original toy, I am pleased that this iteration of Springer looks incredibly similar to the G1’s helicopter mode, which you can see in Auntie Slag’s review of G1 Springer. The general look of the mode resembles the original toy, right down to the color choices. Mainly you will see gray, but there are several other colors here as well, with yellow, neon green, and black playing a role in the detailing. Mimicking the details of the old toy, two striped stickers can be seen on the wings that are turquoise and metallic yellow. You can also find a red Autobot symbol on each side of the tailfin. Additionally, there are some silver paint apps on the fin for the rear rotor. It’s not much, but the rotor stands out over the dull gray plastic of the mould. The mould detail is done well; panel lines can be seen on the top sides of the helicopter, and some more mechanical detailing is seen on the underside. It’s simple, but it gives a the mode a little depth. 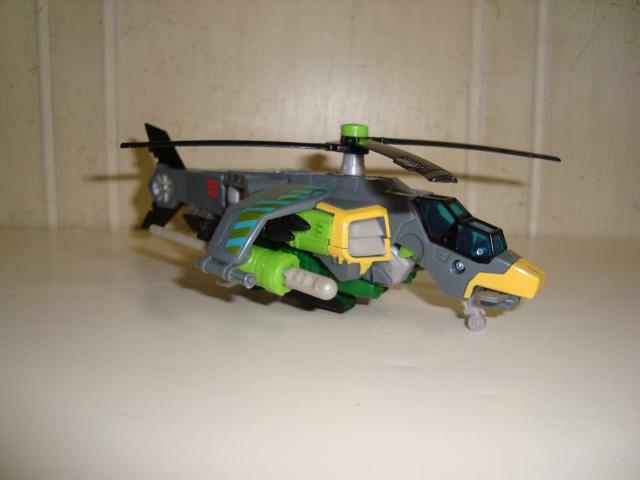 For features, Springer has some very tiny landing gear underneath the cockpit and the main body of the helicopter, and he also has a full loadout of weaponry. Gatling gun turrets are at the ends of the wings (which also double as C-clips), and black molded missiles are tucked under the wings. Neon green missile launchers connect to the bottom of the wings via 5 mm pegs. Two additional C-clip pegs can be found along the underside of the helicopter tail. If there is one thing that bugs me about this mode, it would have to be the lack of a proper spot for Springer’s sword. Granted, HasTak could have taken the easy route and not given him a weapon at all, but in order to store the sword (which only has a 5 mm peg) you have to relocate a missile launcher to one of the C-clip spots. The end result is an unbalanced looking chopper. One nice addition is a small swiveling camera underneath the nose of the cockpit. The blades of the helicopter spin, but mine is slightly unbalanced so they don’t spin to far. Overall, I think Springer has a good alternate mode, and it’s nice to have a Classics figure that isn’t a car for a change. After a simple yet satisfying transformation, you get Springer in all his glory, mechanical alien legs and all. As a note on the transformation: there isn’t anything earth-shattering going on here, it’s just your typical tuck legs and arms here, swivel this, move that. However, it’s easy to go back and forth between modes and nothing pops off randomly as with some other figures. There also aren’t any random panel shifting that utilize tabs, which is a complaint I have with some of the recent car-based molds. Robot mode is the primary reason I purchased Springer. As stated above, Springer is a redeco/remold of the HTFD Tomahawk figure (which was also redecoed/remolded for HTFD Vortex). The figure itself stands well with other Classics/Universe figures. He’s a touch taller than some, but overall the design aesthetic fits in well. I was surprised with this mode too; just like the alternate mode, Springer really closely resembles his G1 toy. In this mode, most of the gray color has shifted to his upper torso, and now you will find that green and yellow are a little more predominant. You’ll even find some gold paint details on the shoulders and forearms. Yellow from the vents in helicopter mode are now on his chest, and the dark green (some people like it, some don’t) from the underside of the chopper is now the primary leg color. I initially found the color a little off-putting, but after looking at the G1 toy, I can see where it comes from. Colors aside, I really don’t like the leg design much. I’m fully aware the toy was designed with the movie line in mind, but if you look at the over all toy, this figure really seems like a half-Classics/half-Movie figure. The torso and arms are simple in nature, with no outright mechanical looking parts. Once you hit the waist, it’s all mechanical/hydraulic/piston details from there on down. Somehow it just doesn’t quite fit, and I’m not sure how well it really fits Tomahawk either. This doesn’t truly detract from the toy; it’s really quite an impressive figure overall. Rather it just may not sit well with people who are going for a certain design look. On the positive side, those mechanical legs/feet are large and sturdy, so getting him to balance isn’t an issue. I think the new head mold is fantastic; neon green with silver paint apps, and blue light piping that works very well. The light piping actually takes up the entirety of the back of Springer’s head. It’s quirky, but I’m glad HasTak didn’t try to paint green all over it to give the head a two-tone look. There really isn’t any kibble on this figure to speak of; the helicopter blades fold neatly back, and the wings can be positioned upright over the shoulders for an attack-like look or they can be hidden on the back by rotating the ball joint down. Springer has quite a few points of articulation, so you can position him well. The downside is that he has no wrists to speak of, so you’re stuck with one type of arm position. However, the elbows can bend and swivel a bit to compensate. Springer has some neat features in this mode as well. The C-clips are now on top of his forearms, so you can clip the missile launchers there, or they have 5 mm pegs, so he can hold them like guns. 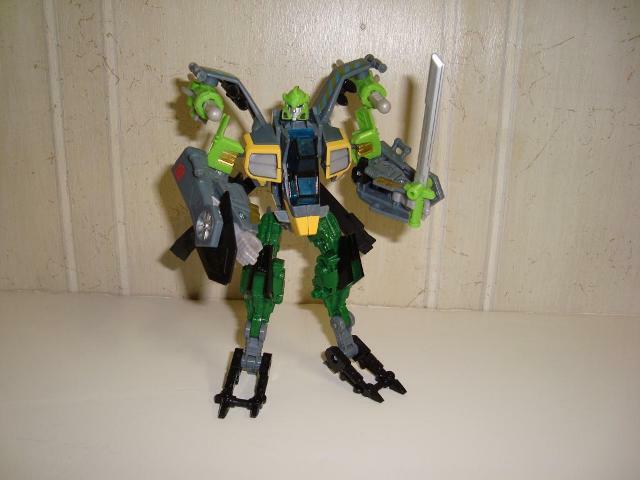 Springer comes with a newly molded sword with a neon green handle and silver painted blade. On Springer’s right hand, the tailfins become a set of ‘pincer blades’. You can open them up for some cutting action, but I prefer to keep them closed, almost like he has his own shield. Sure, I used to own the Cybertron Evac redeco Springer, but this version is better in my opinion. He’s deluxe class, which means he will fit in well on your shelf with Classics Hot Rod (and soon to be WFC Ultra Magnus), so you can complete that Season 3 trio if you like. The neon green plastic is eye-grabbing, and the accessories and details of this figure bump his score up a bit. The cost, exclusive nature, and split design aesthetic detracts some of that. Transformation Design: 8. Simple and smooth. Nothing earth-shattering, but it’s easy and fun to go back and forth. Durability: 8. I don’t see Springer breaking anytime soon. The plastic is sturdy enough to take a beating. The chopper blades may snap years down the line though. Fun: 8. He’s got a lot of fun C-clips, weapons, and details. There’s quite a bit packed into this figure. Aesthetics: 7. His colors and head make him look great. The mix of Classics with Movie design will be hit or miss depending on the person. Articulation: 6. He’s got articulation, and it doesn’t hinder him much. It just doesn’t really add to the poseability. Value/Price: 5. The price of deluxes has gone up everywhere. Regardless of the figure I think $15 USD is too expensive. However, he’ll give you quite a bit of fun for the money. Overall: 7. I don’t think Springer will suit everyone. I like the various fun features in this mold as well as the neon green. He’s an exclusive, so he may be hard to track down. Look at the photos, I think this one will be up to personal preference.